A group of more than 20 University students from Derby has travelled north to enjoy an in-depth look at the quarry at Tarmac’s Dunbar cement plant – as part of a study tour of the North of England and Scotland. The students are studying for a mineral products-based degree which is supported by the Institute of Quarrying and its members and is the only one of its kind in the country. 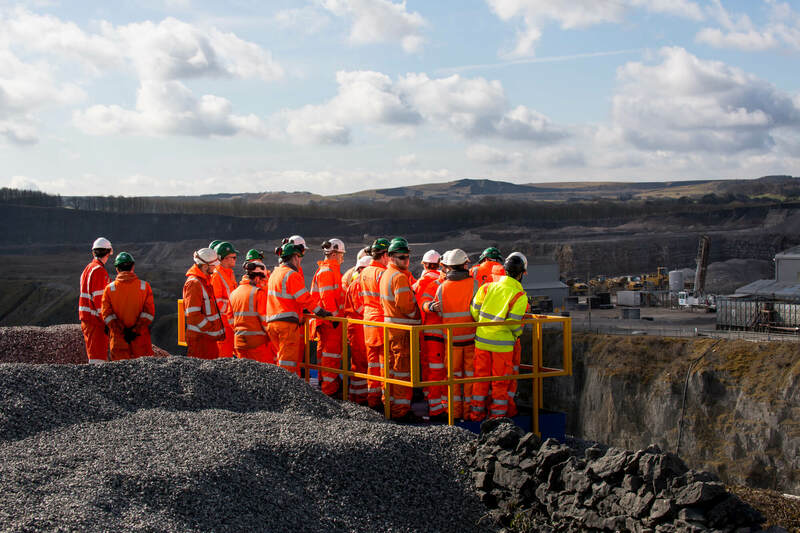 They were given a first-hand look at the quarry, which is an important source of material for the construction industry. Hosted by Quarry Manager Dave Hurcombe, the group was shown how Tarmac plans to extract materials from the quarry; the operation of the large mobile plant; the processing of limestone for the cement plant; and how the land is gradually restored. “The Institute of Quarrying works in close partnership with the Centre for Minerals Products at the University of Derby. Each year we organise a Study Tour that is open to all mineral extractives students on the diploma, foundation and honours degree courses. The aim of the study week is to enable candidates to see how the theory they are studying relates to practice in the real world. It’s an incredibly valuable learning experience where students, educators and industry professionals all come together to discuss best practice outside the classroom." “The study tour represents a fantastic and unique opportunity for students to see at first-hand facilities and processes from a whole range of mineral extractive and manufacturing operations. They gain direct experience of activities that might not necessarily form part of their studies or their day to day duties.